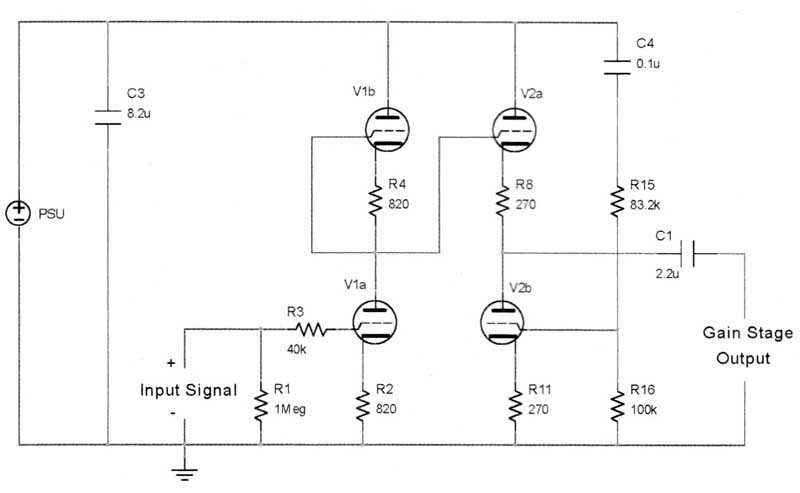 Part 1 looked at a MOSFET single-ended unity-gain source-follower amplifier output stage. This follow-up adds an appropriate gain stage. Designing a power amplifier requires a holistic approach. The output stage needs to be delicately coupled with the input stage for best results. PHOTO 1: Completed TCJ Aikido. To review, you should choose each component for optimal linearity and low noise. The output stage features a MOSFET, which is great for handling high current, but questionable for voltage gain. The design used the MOSFET as a source follower to maximize inherent local feedback and minimize the effects of gate capacitance. The fewer components, the easier it is to concentrate on getting each one right. The output stage has only one active device to worry about. I played a couple tricks (capacitance multiplier and Pass Aleph current source) to earn some bonus points. The input stage will follow a similar philosophy. The vacuum tube can easily handle the required voltage swings (±20V) to drive the source follower and is well-regarded in audio circles. The triode has outstanding built-in inherent local feedback and proven linearity. It doesn’t work so well with high cur rents, which is why valve amplifiers have output transformers, but this won’t be a problem as an input stage. The triode features a high degree of inherent local feedback. As the grid voltage increases, the plate current also increases, causing the plate voltage to drop from where it would have been (thereby also inverting the signal). This is negative feedback and is why triodes usually have lower gain, lower output impedance, and superior linearity when compared to pentodes, which defeat the inherent local feedback by inserting extra grids to decouple the plate current and voltage. Pentodes have much higher gain (less is lost to local feedback) and higher output impedance. Because linearity and low noise are valued, the John Broskie Aikido input stage is an excellent choice (Fig. 1). I have named all of the component designators to match the Tube Cad Journal (TCJ) printed circuit board. FIGURE 1: Tube Cad Journal Aikido gain stage. Note: Gain Stage Output. The Aikido consists of two legs that function (mostly) independently. The first leg (Fig. 2) is the voltage amplification stage. Valve V1a provides voltage amplification approximately equal to mu/2. Valve V1b is an active plate load for V1a. It loads V1a with a copy of itself, so the active load reflects the nonlinearities of the tube being loaded. It is convenient if V1a and V1b are two identical triodes packaged in a common envelope (dual triode). If you use identical triodes, V1a and V1b will be balanced, and the first leg’s output will rest at B+/2. This also means half of any power supply noise will be seen on the output. Cathode resistors R2 and R4 should also be identical to maintain vertical symmetry. Set these depending on tube type. I chose the Electro-Harmonix 6CG7EH, which is essentially the venerable 6SN7, but in a 9-pin package. With a 300V power supply and 33011 cathode resistors, the tubes run at about 9mA current. I have used everything from 270-ohm to 870-ohm resistors with good sonic results. This tube has mu = 20, which results in a gain of about 10. 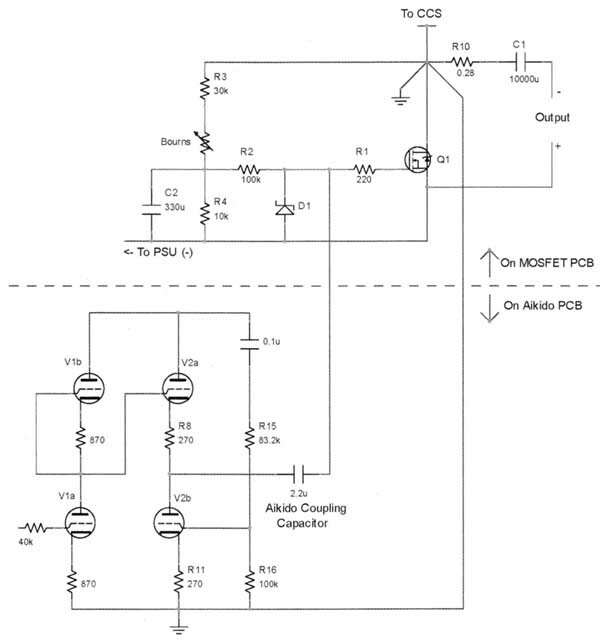 The MOSFET output stage is capable of peak-to-peak ±18V (assuming 50V PSU). My signal sources are Musical Fidelity and Theta DACs, which easily output 2V p-p. 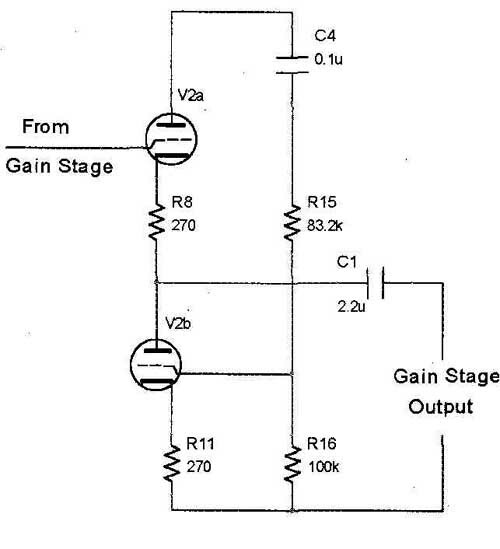 Therefore, I need a gain of only about 10 to push the output stage to full power. If you need more gain, try the 6DJ8 (750-ohm cathode resistor for 6mA and gain of 14), although audiophiles will argue about sound quality of the type. For 12V heaters, try the 12AU7 (gain of 9), 12FQ7 (gain of 10), or 12AT7 (gain of 20). Others may choose to try the octal variant, using the 6SN7 (recommended). The first leg’s output is DC coupled (no coupling capacitor) into a second leg (Fig. 3), which is a unity-gain (actually, a little less than unity) cathode follower (V2a) loaded by an active cathode resistor (V2b). Again, the active load V2b loads the cathode follower V2a with a copy of itself, reflecting nonlinearities. The cathode follower takes great advantage of the triode’s inherent degenerative local feedback (therefore, unity gain). With a twin triode, V2a and V2b will be balanced, and the output will rest at B +/2. Here’s the Aikido magic: Any power supply noise is AC coupled through C4 to the grid of V2b. Resistor divider R15 and R16 adjust the noise injection ratio. V2b inverts the PSU noise and modulates V2a bias current, effectively canceling out any PSU noise that would have otherwise been on the output. It actually works! It is dead quiet. You can calculate the proper relationship with R15 = R16 (mu - 2)/(mu + 2). Cathode resistors R8 and R11 should be identical to maintain vertical symmetry between V2a and V2b. I also chose the 6CG7EH for the second leg. The important parameter is output impedance, which is roughly i/gm + R8. With 300-ohm, the 6CG7EH has about 500-ohm output impedance, which is low enough to drive the beefiest MOSFET in the output stage, even big TO-264 monsters. 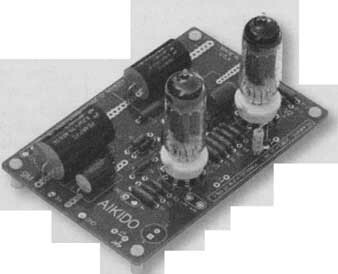 Along with the active devices (V1, V2, and Q1), the Aikido coupling capacitor C1 is sonically important. I believe your money is best spent on active devices (tubes), before capacitors. Choose C1 with whatever budget you have left over after buying your tubes, or save C1 as an upgrade. I used a Solen 2.2uF polypropylene. Capacitor C4 is also in the audio signal path (it influences the grid of V2b). I chose the Dayton film and foil poly propylene 0.1uF. Make sure all volt age ratings exceed your power supply’s maximum (unloaded) output. With octals (8-pin), I’d use the 6SN7. You can try a huge variety of tubes here, making sure the pinouts and heater voltages are correct. With 9-pin minis and 6V heaters, some options are 6AQ8, 6BQ7, 6DJ8, 6CG7, 6FQ7, 6GMS, 6H30 -- the list goes on. Extra resistors R5, R6, R7, and R12 help keep each leg’s output centered on B+/2. These have a number of interesting advantages, including preventing damage if powering up with one socket empty or if a tube goes bad. The resistors maintain the proper B+/2 volt ages, even with the heaters cold! These resistors are 1M-ohm, so they have negligible effects on the circuit’s sonic performance. You can get John Broskie’s Tube Cad Journal Aikido PCB at tubecad.com. You can purchase Aikido boards for both octals (8-pin) or mini (9-pin) valves. Be forewarned: High voltages are dangerous. The audio world needs to pre serve the few brave pioneers who read about and want to build amplifiers like this. Acknowledge the dangers of working with high voltages, and do a favor to all of us: we need you. If you are unpracticed with high voltages, seek assistance. I prefer the nature of a valve rectified, choke filtered B+ power supply. I chose the 6CA4/EZ81 rectifier because it is not grossly oversized for the application and uses a standard 6.3V heater. It is available new from Electro-Harmonix or JJ Electronics (among others). The power supply can be as sophisticated or as simple as desired. I experimented with some regulators, but found the Aikido topology is incredibly resilient to power supply issues. Heroic efforts simply aren’t needed. The schematic is shown in Fig. 5. The Hammond 270AX power transformer provides 5OmA of 480V AC with center tap. Use a dedicated fuse for the AC feed to the power transformer. R18 and R19 are plate resistors for the rectifier. Voltage after rectification is about 325V DC (unloaded), filtered by two stages of pi filters. Capacitors should be C9 >= C10 >= C11, or the pi filters will oscillate during the turn-on process as the capacitors charge. The first choke is 10H, rated at 65mA to handle peak currents. The second choke, being downstream and seeing smoother current, is rated at 30H and 40mA. I chose Solen 400V 12uF capacitors throughout (C9 = C10 = C11). PHOTO 2: Assembled 300V B+ PSU. 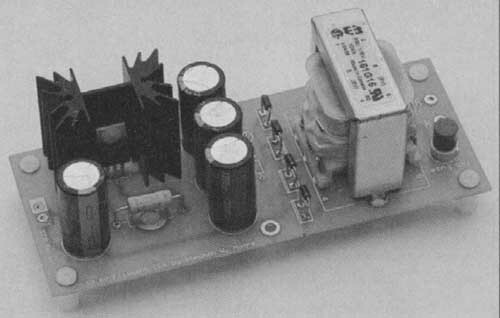 FIGURE 5: 300V B+ PSU. Not wanting a rat’s nest of high volt age spaghetti, I put the power supply on a printed circuit board (Photo 2). I also placed some extra solder pads for the option of replacing C9 and C10 with Mundorf 33uF Tubecap high-value electrolytics, but I’ve been quite happy with the 12uF polypropylene Solens (although, this doesn’t seem to be enough capacitance, especially when I’m accustomed to 10,000uF or more in solid-state designs). The 6.3V secondary on the 270AX runs slightly high, so two 0.75-ohm power resistors buffer the heater. This also has the benefit of slowing down the heater warmup (inrush current and thermal shock), prolonging the life of the rectifier. This power supply has plenty of juice (40mA, limited by my selection of L2) for ambitious experimentation, and can be used for a variety of preamp designs. You can easily obtain different voltages by changing the 270AX with an alternate Hammond model. I used a separate transformer for the Aikido’s heaters. The Hammond 270AX in the B+ power supply didn’t have enough current for two 6CG7s heaters. At first, I used a 6V switching power supply brick. Unfortunately, you could hear the high-frequency switching noise. Ultimately, I achieved the best sound with a DC power supply (Fig. 6). The constant-current feature is probably overkill, but I wanted to try it. The heater supply provides 600mA at 12.6V for the two Aikido 6CG7 triodes (filaments connected in series). The LM317 is connected as a current regulator, and tries to maintain a 1.25V drop across resistor R20 (1.25 V/2.1-ohm = 0.6A). 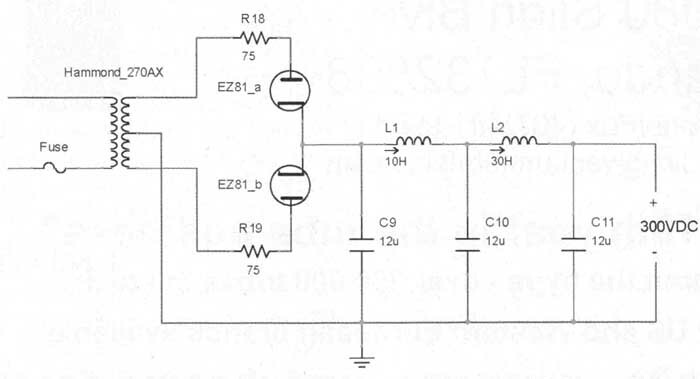 To compensate for the voltage drop across the LM317 and R20, the raw voltage (before the LM317) needs to be 18V. The Hammond 161G28 provides 14V AC with the secondaries in parallel, which is rectified and filtered with capacitor C12 to about 19V. Resistor R20 dissipates 0.75W (1.25V x 0.6A), and the LM317 dissipates about 3.5W Heatsink appropriately. As a matter of practice, I include a fuse for the transformer. I also use an NTC on all high-fidelity power supply circuits that directly feed filter capacitors. The TR5 fuse is the little red button behind the transformer in Photo 3. Now you have a unity-gain, single- ended MOSFET output stage and an ultra low-noise, high-linearity valve gain stage. The output stage was designed to use the MOSFET’s inherent local degenerative feedback to eliminate the dreaded Miller capacitance, making it much easier to drive. The gain stage was engineered around triodes to get linearity, low noise, and the correct amount of gain. The triode’s output impedance can easily drive the MOSFET in this configuration. The MOSFET output stage has an output impedance of 0.25-ohm, being dominated by the 0.22-ohm sense resistor for the Pass Aleph circuit. Removing the resistor and disabling the Aleph drops the output impedance to 0.1-ohm. For my Triangle Acoustics Solis loudspeakers with a nominal impedance of 6-ohm, that translates into a damping factor of 32 with the Aleph and 80 without. I happily trade damping factor for the benefits of Pass's Aleph (Pass discusses the Aleph's benefits in Zen Variations Part 4). I have also found my Solis start to sound dry and lose sound staging with too high damping factors. A side benefit of the Aleph is it increases output power. I highly recommend auditioning some of the Pass Labs amplifiers, because you'll learn a lot from listening to the fruits of his labor. FIGURE 7: Connecting the Aikido to the source-follower MOSFET. The Aikido is coupled to the MOS-FET with capacitor C1 on the Aikido PCB. With the IRFP044, you can achieve good bandwidth with a 0.47uF or larger capacitor. I used a Solen 2.2uF polypropylene, and I am happy with the result. Audiophiles can use paper-in-oil, beeswax, or pizza grease (John Broskie recommends the wet slug approach). As a hat-tip to the Nelson Pass Zen amplifiers and the John Broskie Aikido valve stage, this amplifier has been dubbed the ZenKido. Full output power into 8-ohm is 21V p-p for about 27W. For lower impedances, the output stage runs out of current. For higher impedances, the amplifier runs out of voltage. For example, maximum output into 6-ohm is 16V p-p for 21W, and into 10-ohm is 22V for 24W. 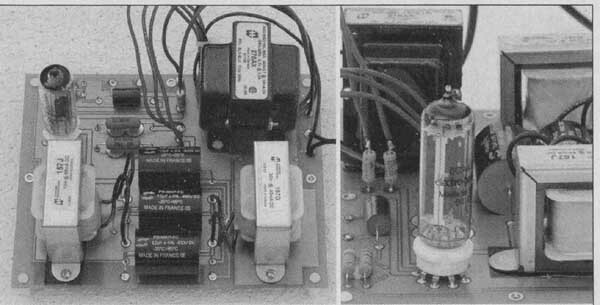 Some could claim that the coupling capacitors may dominate the amplifier’s sonic signature. I find it is actually a combination of V1, V2, and Q1. As Pass pointed out in his article “Practical MOSFET Testing for Audio”, the dominant sonic signature is almost always the active device. Spend more time and money considering the valves than considering C1. For Q1, the IRFP044N is a very good choice, and is also cheap. After choosing the valves, the choice of C1 becomes the next priority. There are many parts to pay attention to: the output stage power supply, the source follower PCB, the B+ power supply, the Aikido PCB, and the heater supply. Even a “simple” amplifier is a very complex affair! The ZenKido was designed around a low-noise, low-distortion voltage amplification stage combined with an easy-to-drive, single-ended, unity-gain, Zen-like output stage. I found that matching between the amplifier and loudspeaker is quite important, contrary to what some noted contributors to this magazine (such as Doug Self) have theorized. My Solis loudspeakers tend to “dry up” and lose soundstaging with highly load-invariant amplifiers. The sound becomes less engaging and more fatiguing. I’ve also noted the same effect with several other loudspeaker brands. Finding the right damping factor for your particular loud speaker appears to be important. The Aikido gain stage imparts sophisticated and refined dynamics. The ultra low noise performance is very nice, especially with my relatively sensitive Triangle Acoustics Solis loudspeakers. The source-follower MOSFET output stage in Part 1 imparts good tonality and a lack of offensive aggressiveness. The combination of the two delivers an overall satisfying combination. The only thing this amplifier lacks is high out put power, so 90dB/watt speakers (or better) will be needed to compensate. Look for flat impedance curves, which help maximize this amp’s potential, especially if the speaker lacks big capacitive phase angles that correlate with low impedance. This amp loves a tube-friendly loud speaker. I’ve tried this amplifier with a variety of speakers, including many DIY creations, and some from Fostex, Paradigm, Definitive Technology, Altec Lansing, and Infinity. My listening tests validate the hypothesis: tube-friendly loudspeakers are the best fit. I plowed through my music collection, listening for accuracy and soundstaging. It’s very tempting to play this amplifier loud, reveling in otherwise hidden nuances and subtleties. Solo vocalists are a joy, due to the soundstaging, profound tonality, and lack of aggressiveness. 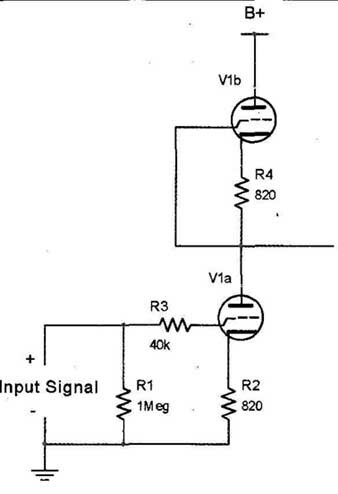 I have found some large sym phonic pieces to get lost in a muddle, presumably because the amplifier runs out of steam at loud listening levels or compression due to loudspeaker capacitive (negative) phase angles, which this amplifier has trouble dealing with. Simply put, this amplifier likes small groupings of musicians. If you listen to a lot of contemporary vocals (Mark Knopfler, Nora Jones, Alison Krauss), jazz, blues (Jimmy Rodgers, Diana Ross), fusion (Bela Fleck), country (Johnny Cash, Randy Travis, Merle Haggard), bluegrass (Ricky Skaggs), gospel, big band, folk, new age (Enya, Enigma), or small orchestral/chamber music, then this amp is worth a try. If your bag is the classic large-format symphony, amplifier/speaker matching will be challenging. That being said, when my system (including this amplifier) is combined appropriately with DIY Linkwitz di pole woofers, I’ve never heard the massive St. Eustache organ for Ceasar Frank’s Piece Heroique (Jean Guillou on Dorian label) replicated quite so. I’ve heard the organ live numerous times, so I have a good feel for the damp, earthy tone the recording should reveal. This was a fantastic match. I’m enjoying the 6CG7EH (9-pin) in the Aikido. I expect the 6SN7 (octal) should also sound very good. This is a tube-roller’s paradise, and along with the Aikido coupling capacitor C1 and MOSFET Q1, there’s plenty of room for experimentation.